PRICE REDUCED! 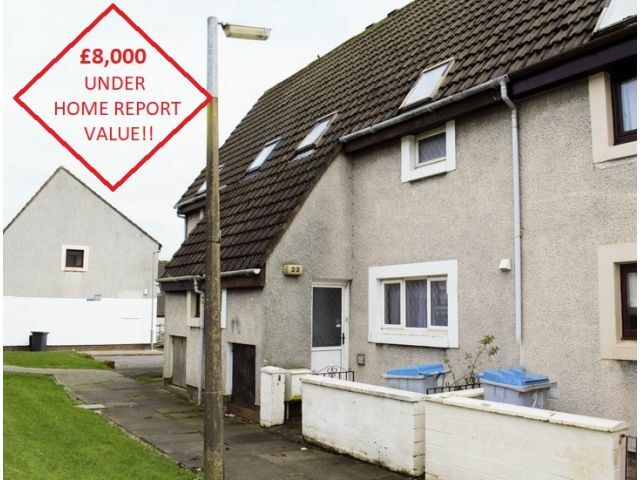 - NOW £8,000 UNDER HOME REPORT VALUE! This three bedroom family home would suit a first time buyer or as a buy to let investment! Located in a popular residential area of Annan and within easy walking distance of St Columbas Primary School. Lounge, Dining Kitchen and WC. One Single Bedroom and Bathroom. Low Maintenance Gardens to Front and Rear and access to communal parking close by. Ceiling light, storage cupboard. Laminate flooring. Coving, two ceiling lights, smoke alarm. Dado rail. Two large storage cupboards. Telephone point. Radiator, laminate flooring. Window to rear with curtain pole and blinds. Ceiling light with fan, TV point. Baxi boiler gas fire with wood surround. Radiator, laminate flooring. Window to front with with curtain rail. Two ceiling lights, range of wall and base units, integral oven and four ring gas hob. Cooker hood extractor fan. Sink and drainer with mixer tap, plumbing for washing machine. Tiled splashback. Space for fridge freezer. Space for table and chairs. Radiator, vinyl flooring. Window to front. Ceiling light, toilet, sink. Radiator, laminate flooring. Loft access. Coving, ceiling light, smoke alarm. Balustrade. Two storage cupboards. Radiator, carpeted flooring. Window to rear. Ceiling light, telephone point. Built in double wardrobes. Radiator, carpeted flooring. Window to front and Velux window to front. Ceiling light, built in double wardrobes. Radiator, carpeted flooring. Velux window to front. Ceiling light, fully tiled walls. Three piece suite comprising of toilet, wash hand basin and bath with shower tap attachments. Radiator, vinyl flooring. Communal driving to front and on street parking at rear accessed across communal lawn section. Small enclosed area to front and enclosed rear garden with low maintenance section, rotary clothes drier and mature planting borders.